Feral cat colonies can quickly become a nuisance especially in urban areas; fighting, caterwauling and the distinct smell of unneutered male cats can be distressing for those living nearby. Adult feral cats cannot be tamed or rehomed in the domestic environment as they are wild animals. 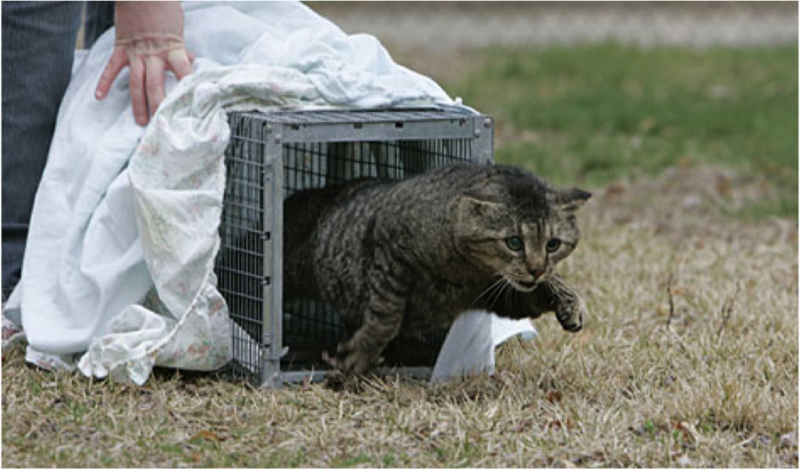 Trap-Neuter-Return, commonly referred to as 'TNR,' is the method preferred by Cats Protection to effectively and humanely control feral cat populations. Once a colony has been identified, our TNR volunteers trap the cats and kittens by setting up humane traps – similar to cages – and safely capture feral cats and take them to be neutered. This is mainly done during the evening and the traps are collected quickly to minimise stress to the cat. This can be hard work; involving a lot of patient waiting and test of wills against these naturally wary creatures which have had little or no human contact. The trapped cats are taken swiftly to a veterinary surgery to be neutered, a straightforward procedure which will prevent the cat from breeding. At the same time, they will also have their ear ‘tipped’ – where between half and one cm of the tip of the left ear is removed under anaesthetic. This serves as a permanent visual mark from a distance to show the cat has been neutered, to prevent the same cat being trapped for neutering in future. After neutering, the cats will be returned back to their territory. Trapping and neutering a large feral colony can take weeks and regular monitoring is needed to make sure that no cats are missed. Ideally, any breeding females are trapped and neutered first, to avoid growth in colony size while the process is taking place. For more information about feral cats, scroll down for FAQs. If you are interested in helping us with our TNR programme, or would like to talk to us about a feral colony, please call our helpline on 01902 651173. The term feral describes members of a domesticated species that have reverted to living as wild animals. Feral cats have had little or no contact with humans. They can never be tamed and this should never be attempted because they are very fearful of people and it would seriously compromise their welfare. Feral cats live alone – or in groups called colonies – and are found in towns, cities and rural areas. The best solution for feral cats is for them to be neutered and returned to their familiar environment. What makes a cat feral? Cats learn what is normal when they are very young kittens and their brains are developing. The point in a kitten’s life when it is aged between two and eight weeks old is known as the ‘socialisation period.’ Young kittens which have had positive contact with people and are handled during this critical time form a bond with humans and enjoy living as pets. Feral cats are the offspring of stray, feral or abandoned domestic cats and have missed out on these early positive experiences with people. They should not be confused with stray cats which were raised as pets but have since been lost or abandoned. Although stray cats can be scared of people due to their experiences, they can often be rehabilitated and go on to live life as a pet again. Sometimes farm kittens will have been handled and treated well by farm workers and children – enabling them to adapt to life in the home. These kittens would also not generally be considered feral. This means that cats that haven’t become dependent on people can live well in the wild, as long as they have all the things they need. Cats are extremely resourceful creatures and can adapt to many different habitats. Unlike pet cats which often don’t get on with other felines, feral colonies will often naturally develop. These are usually made up of groups of related females and the size of the colony is directly related to the availability of food, water and shelter. Cats within the colony recognise each other by sharing their scent through rubbing against each other. Although they appear close, they are not completely reliant upon each other and will hunt and eat alone. If an unfamiliar cat intrudes on their territory, they will soon see it off. Feral cats are not always found in colonies – some will live a solitary lifestyle. Regular feeding Many feral cats are very resourceful and find adequate food, but it may be helpful to offer them extra help, especially in winter. Only offer food if the feral cats have been neutered. This is important because feeding unneutered cats increases the number of kittens that are born. It is also not in any cat’s interests to become fat and this is particularly true of feral cats as it affects their agility and chance of survival – so avoid overfeeding. Contrary to popular belief, regularly fed feral cats are better hunters than hungry ones. Observation It is helpful to observe colonies, so that any new unneutered, sick or injured cats can be promptly trapped and taken to the vet. Only minor ailments can be treated in feral cats and sometimes they have to be euthanased on welfare grounds if they have significant illness or injury. Why not just remove feral cats? Catching and removing feral cats may temporarily reduce the numbers, but this leads to what is known as the ‘vacuum effect.’ Any cats left behind will continue to breed and others will move into the area which is clearly a good source of food and shelter. The solution is to trap, neuter and return the cats. Over a period of years this will reduce the size of the colony. A controlled, healthy and stable colony will deter other feral cats from moving in and will keep vermin levels down. In very rare instances, relocation may be necessary but should generally be avoided. Relocation of feral cats is extremely stressful for them, as they become very dependent on the familiarity of their own environment. Feral cats should not just be released elsewhere, an appropriate habitat needs to be found and the cats need a period of adjustment while they learn where they can find food and shelter. Remember, cats are protected by law and killing a cat constitutes an offence. Very young feral kittens can sometimes be socialised with humans through gentle handling and positive experiences before they become too fearful of people. However, genetics also plays a role in the confidence and friendliness of cats, and it can sometimes be better for the welfare of feral kittens for them also to be neutered and returned to the wild.